Reichsmarschall (literally translated as Marshal of the Empire, but the German term is used in English) Hermann Wilhelm Goering (January 12, 1893 - October 15, 1946) in his first official photograph after his promotion to Reichsmarschall. He is holding his Luftwaffe Feldmarschall's baton, given to him by Reichskanzler (Reichchancellor) Adolf Hitler on February 4, 1938, encrusted with gold crosses and eagles, and capped in diamonds. He appeared in a similar sky blue Luftwaffe uniform in a large portrait at the entrance to the Berlin Headquarters. He designed his own uniforms and would change five times a day, depending on his mood. In a speech to the Reichstag (German Parliament) in September 1939, Hitler had anointed Goering as his successor. In an evening ceremony at the Deutsche Staatsoper Berlin (Berlin Opera House), Hitler awarded twelve generals promotions to Feldmarschall (Field Marshal) and elevated Goering from Feldmarshall to Reichsmarschall. Other officers were promoted as well for their actions in the Battle of France. The promotions gave the armed forces a clear line of succession and was intended to prevent fighting over command if Hitler was incapacitated or assassinated. Goering's subordinates felt that his promotion to Reichsmarschall was the last day the Luftwaffe had a leader; he retired after the ceremony for a party at his Berlin residence, stoked with foodstuffs from the subjugated nations of the Reich, and enjoyed his new position. The ceremony, held at the height of the Battle of Britain, allowed Hitler to call for the British to surrender or face "unending suffering and misery." Goering was unable to bring the Royal Air Force to destruction; the Luftwaffe's losses were unsustainable. The other Luftwaffe officers promoted at the same time had no relief for the rest of the war. After failing to supply the surrounded 6th Army during the battle of Stalingrad in 1942, Goering increasingly fell out of favor. When the Royal Air Force and the United States 8th Air Force began bombing Germany "around the clock" despite a maximum effort by the Luftwaffe, Hitler blamed Goering; the Fuerher was encouraged by Martin Bormann, who wanted to discredit Goering. Goering retreated into the high life; collecting stolen works of classic art, hunting on his estate confiscated from Jews, and abusing drugs and food. Luftwaffe officers had to come to him. When he did rarely appear in front of Luftwaffe pilots and his own ground forces, he stunned them with his appearance, overweight, sweaty, disconnected, angry, and sometimes wearing makeup. Goering would berate his men for failing to stop the bombers, but never listened to their entreaties for more training, production, better gunsights and aircraft. By 1945, Goering was totally out of favor, and no longer welcome in the Fuehrer's presence. He took Hitler's decision to stay in Berlin as a sign to act on his decree of succession. 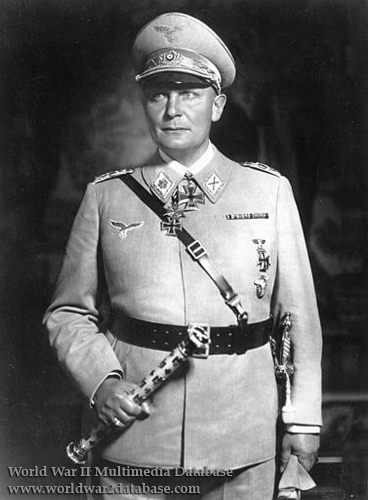 Enraged over a suspected coup d'etat, Hitler ordered his arrest and execution of Goering and his family on April 25. Goering survived and was arrested by the Allies on May 9. This same uniform, without the medals and the baton, was the one he wore during his press conference with western reporters in Augsburg on May 11. He was the third highest ranking Nazi to stand trial in Nuremberg. After a vitriolic and spirited defense (he wore a double-brested uniform too large for him since he lost weight in prison and was denied drugs), he cheated the hangman a few hours before his scheduled execution by taking cyanide. Goering's baton is on display at the National Infantry Museum in Fort Benning, Georgia.